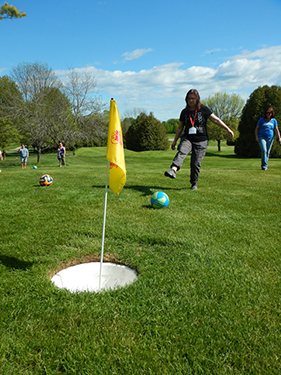 MACKINAC ISLAND, Mich. – Perhaps footgolf is the love child of FIFA and the PGA. Regardless, this hybrid sport bound only by the fact that both soccer and golf need a ball to play is an activity for practically everyone. 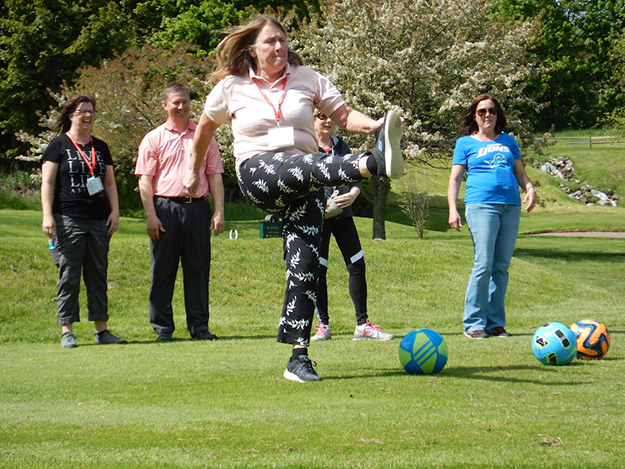 Almost regardless of age, gender or athleticism, practically everyone can play footgolf. “Way to get some leg into it!” yelled the footgolf crowd as a round began at Michigan’s Grand Hotel - Image by Tom Adkinson. My introduction was at the Jewel, the traditional 18-hole golf course at Grand Hotel on Mackinac Island, one of America’s most historic resort destinations. I hadn’t expected an activity so untraditional at such a refined resort that opened its doors for Gilded Age summer guests in 1887. The day’s last golf foursome had teed off, and it was time for the footgolfers to have their turn on the beautiful links high above Lake Huron. The nine-hole footgolf course crisscrosses the Jewel’s first three holes. 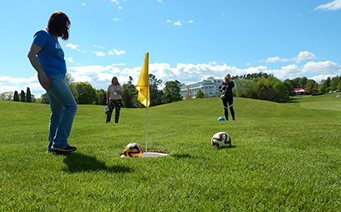 Grand Hotel’s foray into footgolf began in 2015, according to golf pro Jason Horricks. Grand Hotel, one of America’s most historic summer resorts, is the backdrop for part of the footgolf course. Image by Tom Adkinson. The basics of footgolf are simple and rather obvious. The American FootGolf League (yes, there really is an American FootGolf League) suggests “golf attire” and mandates use of a #5 soccer ball that players kick into 21-inch diameter cups. 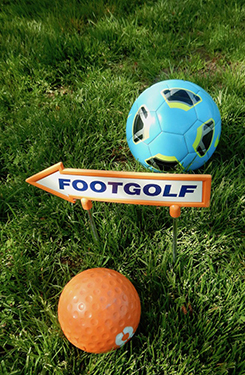 A footgolf course takes advantage of a traditional golf course’s fairways, sand traps and water hazards. If you have to play out of a sand trap, there are no special shoes (sand wedges? ), and if your ball splats into a water hazard at Grand Hotel, the staff has placed a net on a long pole so you can fish it out. 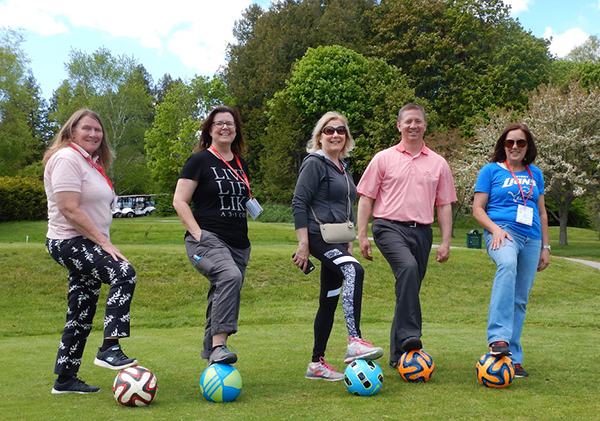 When the four women in my group and I teed off (if that’s the footgolf correct term), at least some of us had visions of sailing that soccer ball down the fairway at least half the distance a Manchester United player would do. Truth be told, I don’t know what my companions thought, but I had delusions of skill and strength. Manchester United players, and probably every high school player in the country, can deliver distances several multiples of what I could. My short game wasn’t any good, either. The nice thing is that lack of skill didn’t matter. We had a blast. Errant balls were more common than not. We barely pretended to keep score. We laughed until it hurt. And nobody pulled a muscle or threw a hip out of joint. Horricks said that’s the beauty of footgolf. “Footgolf is fun because it’s a family affair. It’s an excuse to be outdoors, to be in nature and to enjoy our great views. We do get a few soccer players who take it more seriously than others do, but most people play just for fun,” Horricks said. Because footgolf moves along so quickly, it’s not bound by some of golf’s traditions. Horricks said he often has groups that include three generations of players, mentioning a family group of 10 he put on the course recently. Grand Hotel golf pro Jason Horricks delights in the smiles footgolf brings to newcomers to the hybrid sport. Image by Tom Adkinson. Unlike golf, the cost is modest. At Grand Hotel, the fee is $15, and that includes the soccer ball, which you do have to return. It would be difficult to claim you lost one in the rough. When footgolf makes sense at a course, pros like Horricks see multiple benefits. It creates new customers, it gets people active in the outdoors and it provides a little spice late in the afternoon when regular golfers have retired to the 19th hole. The American FootGolf League, which dates to 2011, lists 500 courses spread through all 50 states, the District of Columbia and Puerto Rico. It says the sport’s uncertain origins were around 2001 and says more definitely that the first footgolf tournament on a golf course was in the Netherlands in 2008 between teams of Dutch and Belgian soccer professionals. The first FootGolf World Cup sanctioned by the Federation for International FootGolf (yes, there really is a Federation for International FootGolf) was in Budapest in 2012. Can footgolf as an Olympic sport be far behind? Trip-planning resources: GrandHotel.com and FootGolf.us.